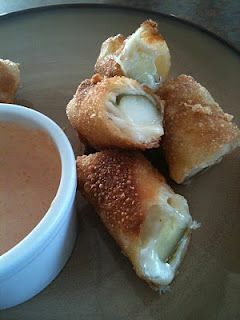 I found this recipe on Pinterest a while back and got with my daughter to make a batch for her hubby's birthday party. BIG HIT!! So now we look for special occasions to make these. You know, Saturday, Sunday, rainy day...well, you get the picture. Here's the recipe. Give it a try. Place your pickle and cheese diagonally on the wrapper, flip in the sides, and roll. Dab a drop of water on the edge to seal. Heat oil and fry until crispy and golden brown. Drain on a paper towel. Yum! You can use a bottled dressing/sauce or spice up a bowl of ranch with Sriracha or Frank's Red Hot Sauce...again, your taste. After your first batch, you'll be looking for other stuffings. We tucked a jalapeno slice or two in with the pickles and cheese, made apple pies with a can of apple pie filling sprinkled with confectioner's sugar, and even wrapped up Reese Cups. Pumpkin pie is next!! Give these yummies a try. You'll love them!